Jiggs Whigham at the Three Nations gig in Bury St Edmunds, 5 April. Photo by Matt Pannell. Considering the chaotic times we live in and the political turmoil we are currently enduring, it was singularly ironic that this event at Blackheath Concert Halls was titled “Three Nations Under One Groove”. NYJO’s MD Mark Armstrong and Bujazzo’s MD Jiggs Whigham both alluded to the fact that there is now more than ever reason to treasure the cooperation of the three European big bands who appeared that night. They indicated that we the audience should bear in mind that the three groups of musicians all speak the same language, not just English (“which everyone speaks”) – but jazz. The three big bands in question were NYJO (National Youth Jazz Orchestra), the UK’s brilliant orchestra that began life in 1965 under the directorship of Bill Ashton; Bujazzo, the Bunesjazzorchester of Germany; and the NJJO, the Nationaal Jeugd Jazz Orkest of Holland. The concert was, inevitably, divided into two halves, the first showcased each of the national big bands in turn. NYJO kicked off a coruscating number featuring vocalist, Helena Debono. Then Laura Jurd’s No Man Is An Island was given an electrifying treatment and Paris Is For Lovers featured singer Freddie Benedict. Next was the NJJO led by its MD Johan Plomp. The set began with Plomp’s composition, the fiery Paper Dragon and concluded with two other numbers, again penned by Plomp. 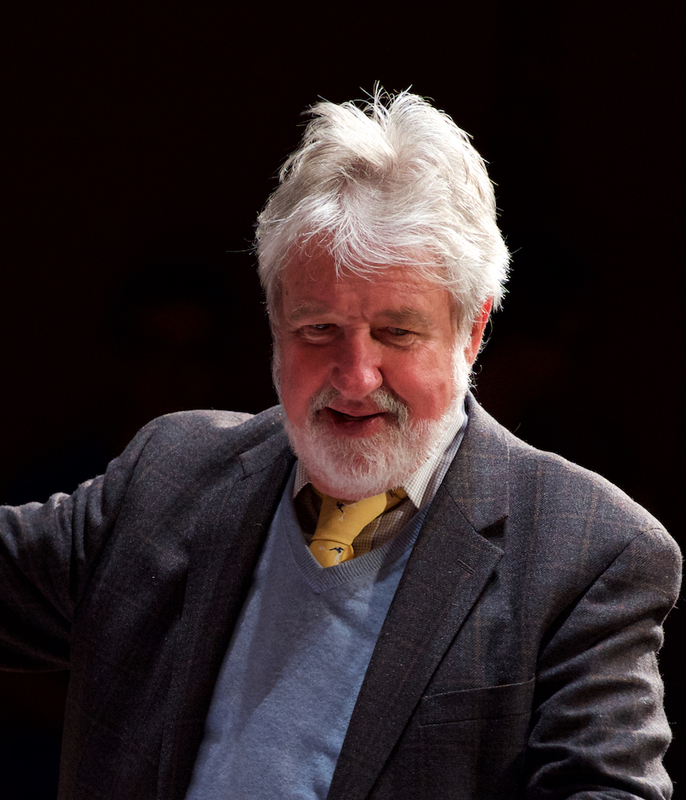 The third group, Bujazzo, was led by trombone legend Jiggs Whigham, who reminded the audience that he was last in the UK with Stan Kenton’s orchestra back in 1963. However, the septuagenarian was still in fine fettle and his selection of numbers was terrific. The band opened with the fantastic Francy Boland arrangement of Nacio Herb Brown’s You Stepped Out Of A Dream followed by a phenomenal version of Boland’s Sax No End featuring all five of Bujazzo’s sax players. It was a genuine treat to hear the music of the Clarke-Boland Big Band played live again. The second half of the programme (mixed bands) featured three successive permutations of the three bands led by the national MDs in turn. The first set comprised numbers by John Plomp who conducted. The second led by Mark Armstrong, included his labyrinthine setting of Gustav Holst’s Ballet Music From The Perfect Fool. Finally it was Whigham’s turn and the band played Chick Webb’s Stomping At The Savoy followed by Young Blood by Gerry Mulligan and Lulu’s Back In Town, sung convincingly by Luca Manning. The encore, in which all the musicians returned, two thirds of them populating the stage behind the currently performing musicians, was a rousing version of Francy Boland’s Rue Chaptal, and again it was so great to hear the music of the CBBB living and breathing once more. The concert, part of a three-leg British tour, provided immutable evidence of the need for cross-European cooperation (with or without a “deal”) in jazz. It also demonstrated how brilliantly talented and professional all these young musicians are – we’ll doubtless hear much more of them in the future. Finally, Blackheath Concert Halls (part of Trinity Laban School Of Music) should be applauded for continuing to promote such high-calibre jazz concerts, particularly given the dearth of major jazz venues in the south-east of London.